Defaced women showed the real face of beauty in a ramp walk at Agra. 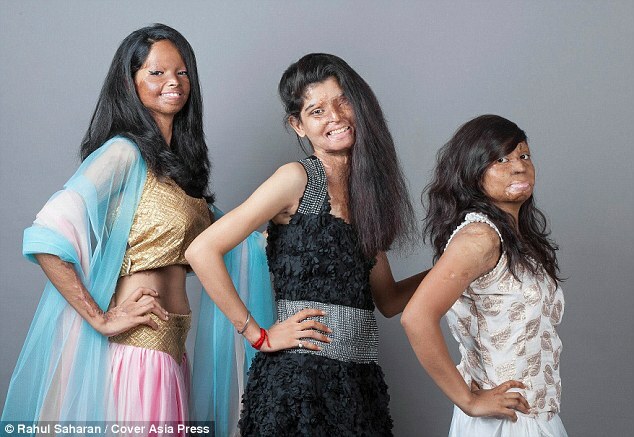 Indian acid attack survivors walked the ramp to tell the world that real beauty lies in one’s spirit and soul, not skin. The unique fashion show was organized by a leading international fashion brand to celebrate the spirit of “Sheroes” by launching its festival collection in Agra. At the show, Sheroes – as opposed to Heroes – displayed latest fashion collection inspired by ethnic arts, crafts, and traditional values imbued with a tinge of modernity. Kanika Pahwa, senior marketing manager of the brand said that the event was a tribute to the real beauty and spirit of women associated with Sheroes Hangout cafe in the city. The Sheroes Hangout has women who have fought back for life and survival through terrible chemical burns and now wish to define themselves as warriors. Dolly, Rupa, Ritu, Nitu and Geeta, the five ‘Sheroes’ models who walked the ramp, said they lead a life on their own terms, “representing the spirit of dignity with purpose”. “The fashion show shows we are not defeated or cowed down but willing to put up a brave fight,” one of them was quoted as saying. India and Pakistan yearly face a huge number of acid attacks, but due to no rule of law, victims could not get justice. Why can’t we introduce more places like Depilex to support our acid attack victims? There are a lot of restaurants opening nowadays, why any entrepreneur did not thought of employing these women, who have faced a lot in their lives because of someone else’s brutality. Such Sheroes can be found in our motherland as well, we just need to give them a platform to, for a new beginning.